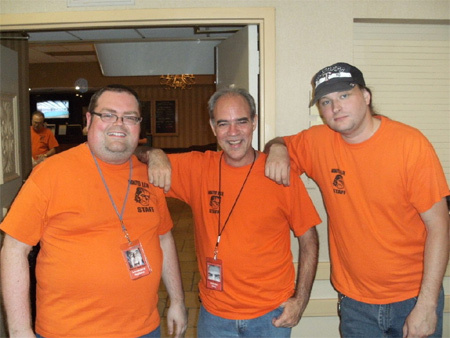 Photos provided by Barb Heiss, Kevin Slick, Brian Keegan, Theron Statler, Ted Lewczyk and others - thank you! Hammer Girls join in for some Monster Bash Cake too. 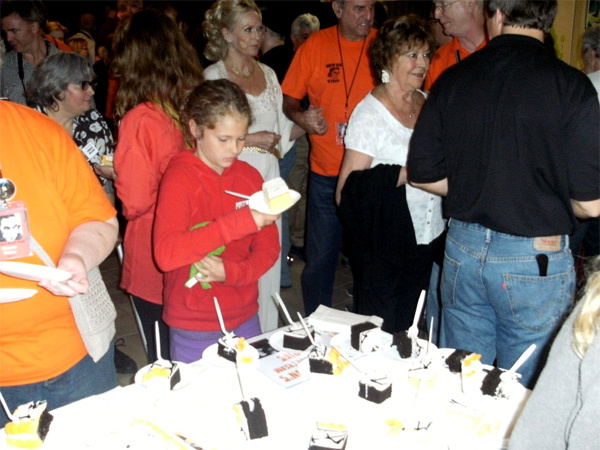 Veronica Carlson and Yvonne Monlaur feast on cake. 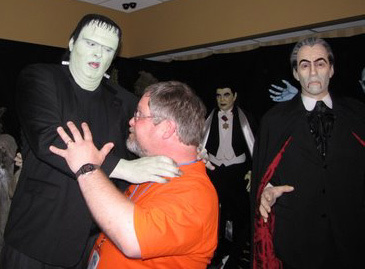 Monster Bash staffer, Brian, in orange, helps out. Sponsor Mark Pirsecki, also in orange, looks on from the top left. Hammer Horror star Caroline Munro gets to have her cake and eat it too. 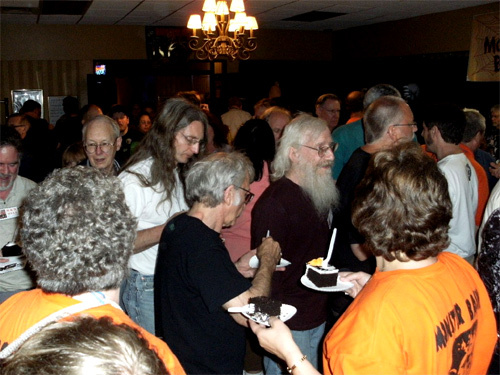 Ah, the cake crowd never ends. Ursula in full make-up gets ready to climb into a coffin for the evening festivities. The Reel Magik Team with Ursula. 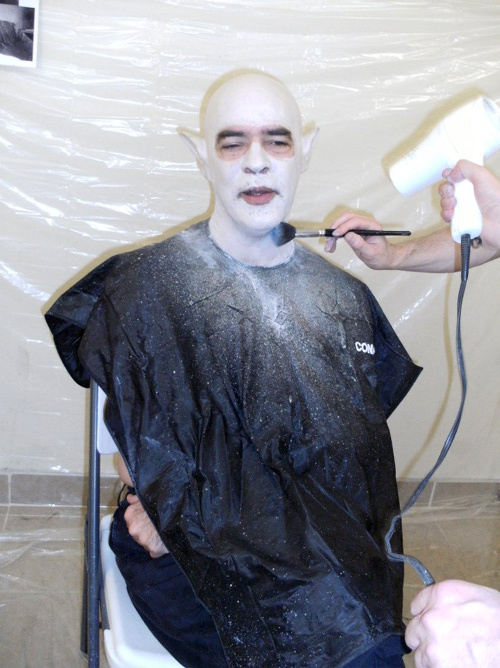 Kevin Slick is about to become Nosferatu at the hands of John and the Reel Magik Team! Wait a minute! Among those lobby figures...one is moving! 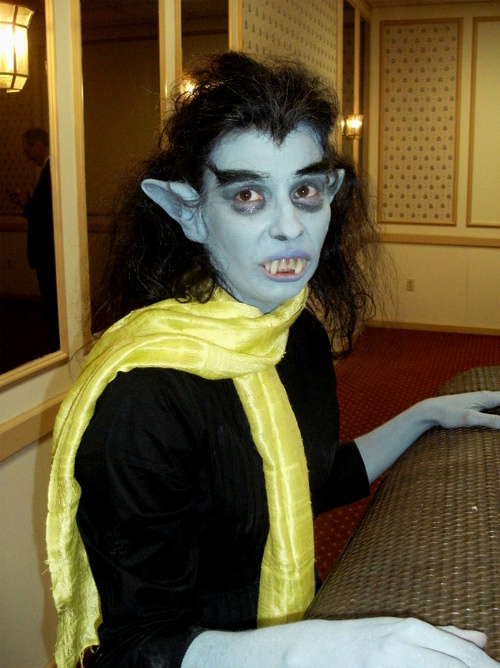 It's Kevin as Nosferatu - Count Orlak! Three Bash staffers that came with beards...lost their beards, became monsters, then were bearless in the cold light of morning. 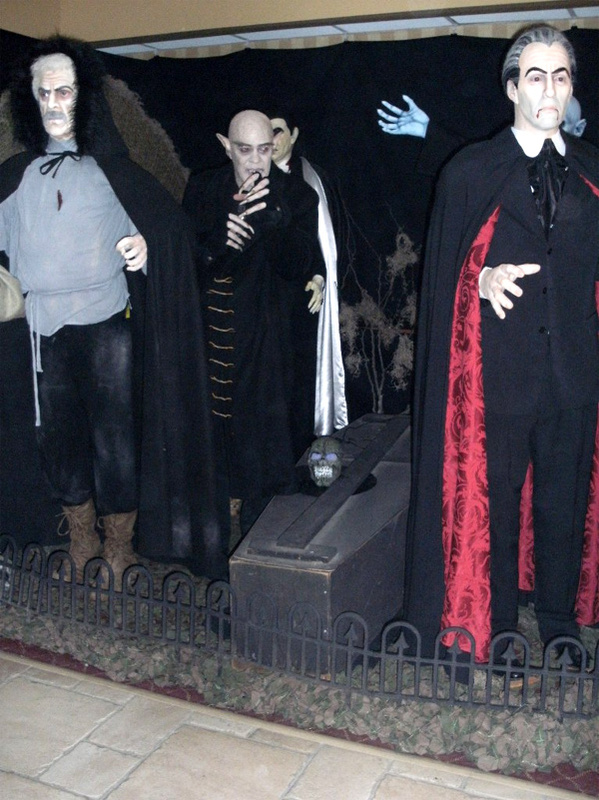 Lenard Hayhurst (Mr. Hyde), Kevin Slick (Nosferatu) and Dan Weber (The Frankenstein Monster). 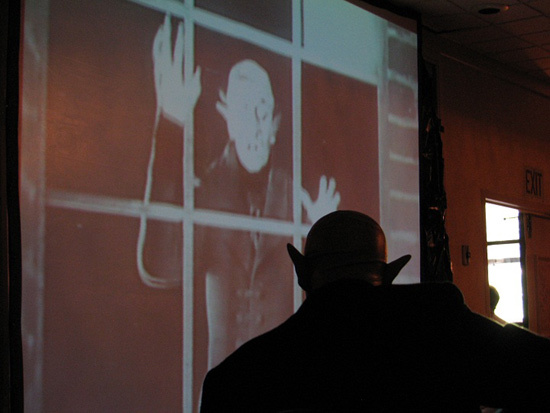 Over the shoulder of Nosferatu as he plays guitar accompanyment to his own movie! 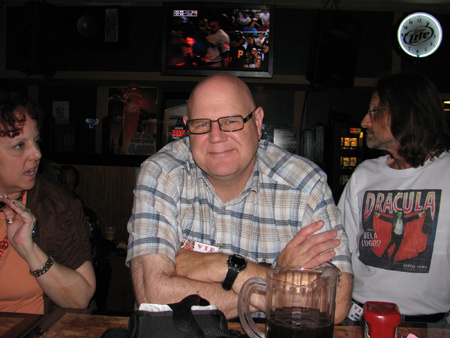 Comedian Don Reese with Gwen to the left and Rob St. James to the right at the Monster Bash bar. Hammer dreams come true....Mark Statler with Veronica Carlson. Theron Statler with Caroline Munro in DRACULA BASH A.D. 2011. 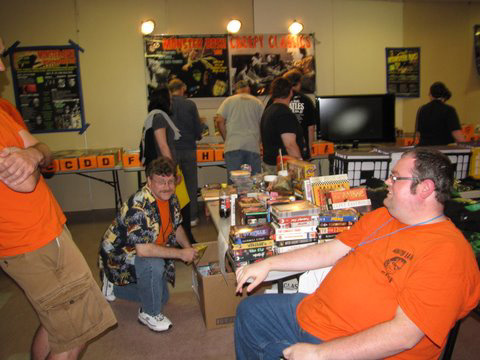 The Creepy Classic Room with Shawn and Leonard. 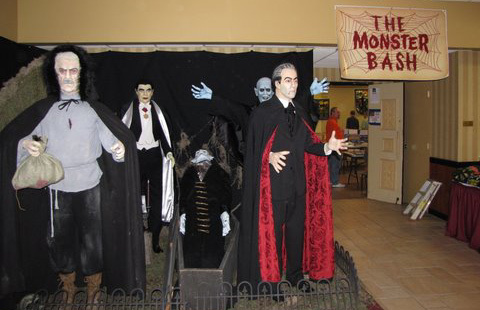 A horde of vampires await you at Monster Bash. Wait! Some of those monsters are alive! Alive! 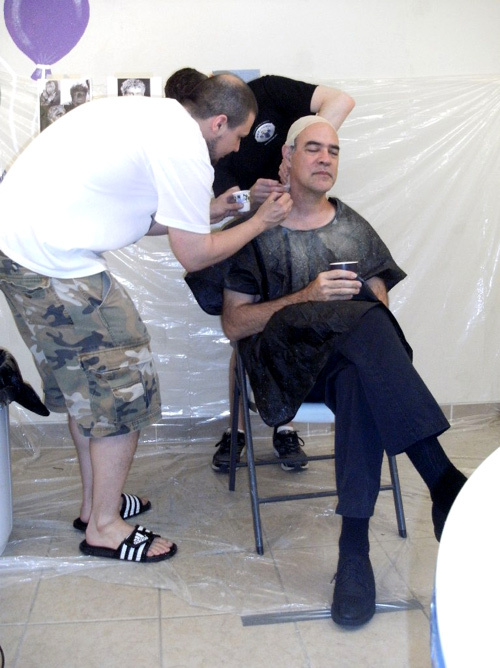 The Frankenstein Monster (Dan Weber in Jesse Melchior make-up) attacks Ted Lewczyk. 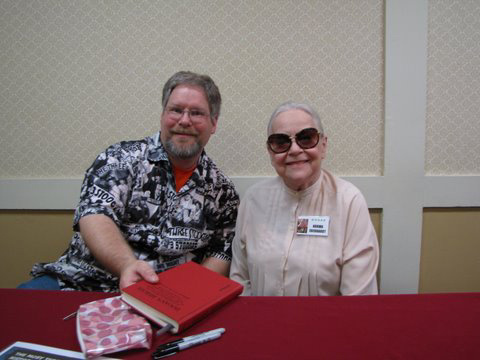 Bash staffer Ted Lewczyk and RETURN OF DRACULA star Norma Eberhardt. Mary Ann from Gilligan's Island and Bash attendee Mark Statler (Check out his Monster Music Rockabilly CD at Creepy Classics! ).